Not only store owners themselves, but thousands of web developers trust their store database migration by turning to Cart2Cart. One of such web experts has kindly agreed to share his experience and impression of performing PrestaShop to PrestaShop migration that might come in handy for you, our dear readers. Please, meet a devoted professional from Netherlands -- Gijs van Woerdekom, who works at Woerdekom Webdesign and provides both websites and webshops development, as well as SEO service. Let’s get to know each other, Gijs! So, tell us a bit about yourself. What are you up to lately besides running an e-Commerce business? Hello, I am a web developer, besides e-Commerce als CMS websites and software development. We know you’ve recently undergone a successful PrestaShop upgrade using Cart2Cart. Congratulations with that! However, what were the motives? Have you had any troubles with the old version, or were you just excited to seize new PrestaShop features? I found Cart2Cart after searching the internet. Everything was looking good, so I talked to my customer who had to agree with the price. Handling the migration on my own would be too difficult for me - there was hundreds of products and a different database structure on the old shop. Also lots of categories. So why starting a difficult migration myself instead of using this fixed price solution? I’ve performed a test migration for two times, asked for some feedback from a technical engineer, and when everything was looking good, I’ve launched a full migration. A few days later, when I finished store customization, everything was looking fine again. No technical issues occurred! Why did you opt for Cart2Cart? And how is your experience using our service? We’d love to hear your suggestions on improvements too, if the are any. That’s what allow Cart2Cart to become better. When I found Cart2Cart, I submitted a ticket with a couple of questions, and got everything answered and explained. The feedback was fast and clear. I have no further suggestions of improvement, everything is fast and understandable. While a great deal of our clients use Cart2Cart to switch to other solutions, you seem to be content with PrestaShop. Would you recommend other store owners to move to PrestaShop? To your mind, what are its benefits over other carts? 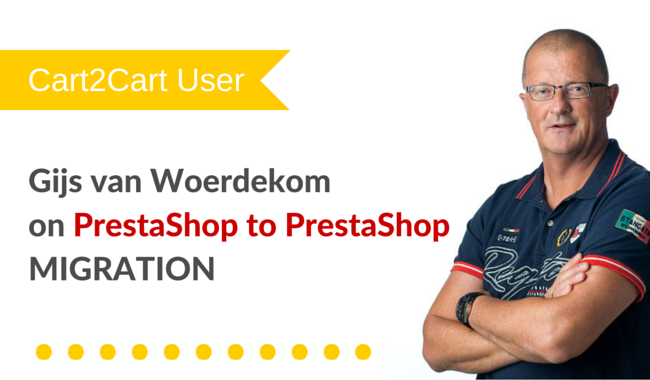 Unfortunately, I specialize in PrestaShop and have experience of working with PS exclusively. So I have no idea what other platforms can offer. Cart2Cart team expresses a sincere gratitude to Gijs for choosing Cart2Cart and agreeing to share his experience with our readers. We wish him good luck and an avalanche of clients. Come back again!